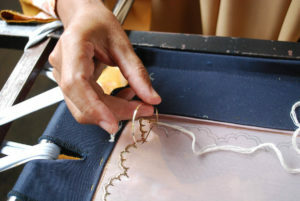 Kelingkan, also known as keringkam in Sarawak, is a traditional Malay embroidery technique that employs a flat metallic ribbon or plate coated with a gold or silver colour. 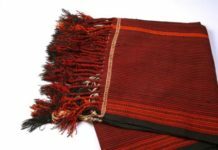 Unlike tekat, where the metallic threads lie on the surface of the fabric, with kelingkan the ribbon-like strips, which are threaded through a special flat, double-eyed needle, pierce the surface of the fabric, a technique known as tikam timbus (literally “pierce and bury”). 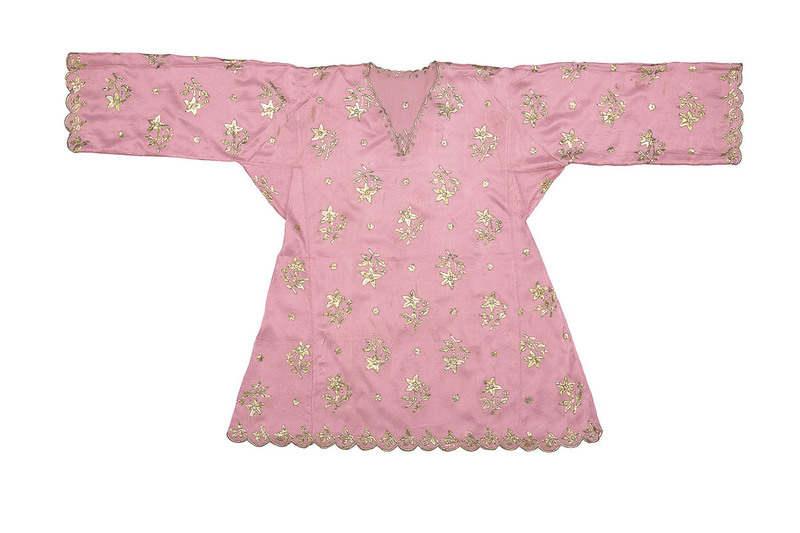 The fabric, usually a fine, even-weave material like silk, voile, net or fine cotton, but also damask, velvet or satin, is stretched taut on a rectangular embroidery frame. The embroiderer passes the metallic ribbon through the fabric making sure it remains flat and untwisted. Borders are usually stitched before the central pattern. In the past, kelingkan-embroidered tunics such as the baju kurung and baju kebaya and headscarves or veils were popular among female members of the royal families of Selangor, Perak, Kedah, Kelantan and Terengganu. Kelingkan was thus seen as a symbol of status and wealth. It was not uncommon for these royal ladies to be skilled in kelingkan embroidery, with each royal household developing its own repertoire of motifs and techniques. Kelingkan embroidery requires a high level of skill, attention to detail, concentration and patience. The embroidery can be done directly on a piece of good quality fabric or made on a less expensive one, then cut and appliquéd onto a more expensive fabric. This also allows recycling of embroidered patterns from torn or worn clothing. 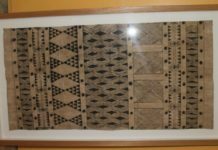 After the work is completed, the embroidered sections are pressed flat by rubbing them with the smooth surface of a cowry shell, round stone or ceramic cup. The most celebrated kelingkan masters are Pojiah Jaya from Sarawak and Nik Rahimah Nik Idris from Kelantan. Pojiah was awarded the title Adiguru Kraf (Craft Master) in 1987, while Nik Rahimah was awarded the same title in 2013. The craft is continued and taught by well-known practitioners, including Raja Nor Akmar Raja Bahari, Robitah Hashim, Azyla Adami, Doris Reji and Mastura Sidek.